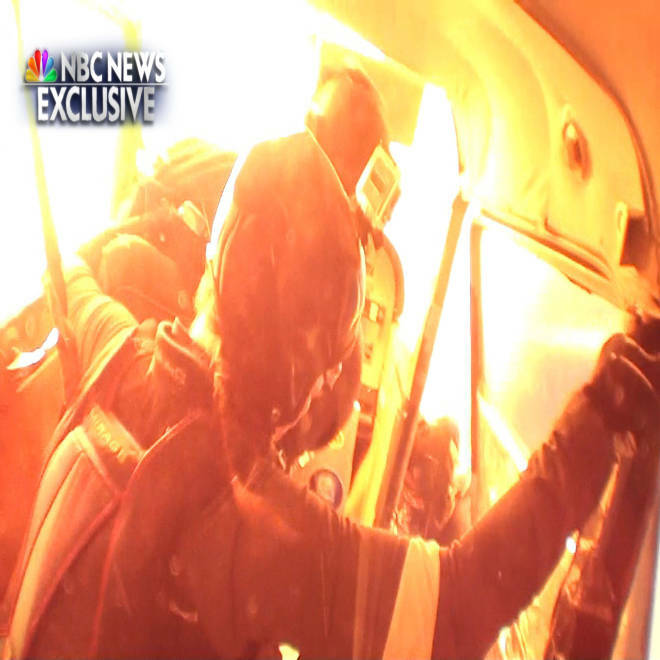 In video licensed by NBC News, one plane appears to fly right on top of another, forcing skydivers from both planes to jump while avoiding burning debris. NBC's Anne Thompson reports. 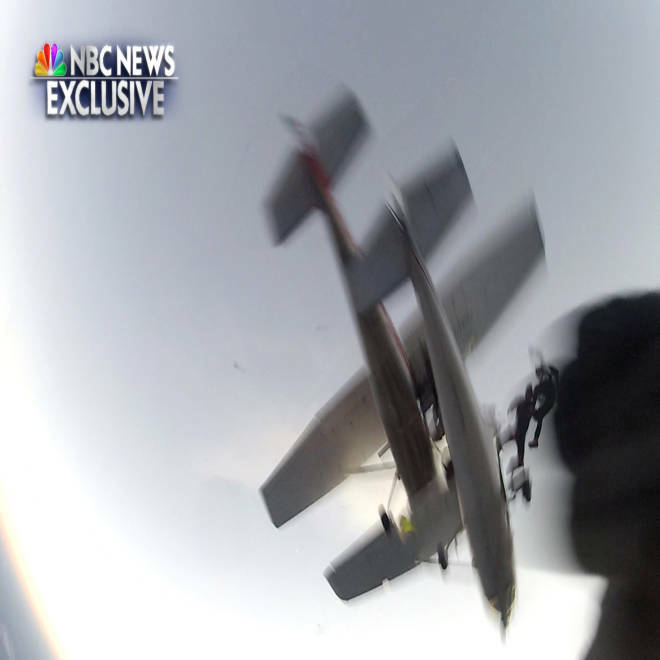 The cameras strapped to the skydivers' helmets were supposed to memorialize their perfectly timed jumps and exhilarating descent from two small planes to the earth 12,000 feet below. 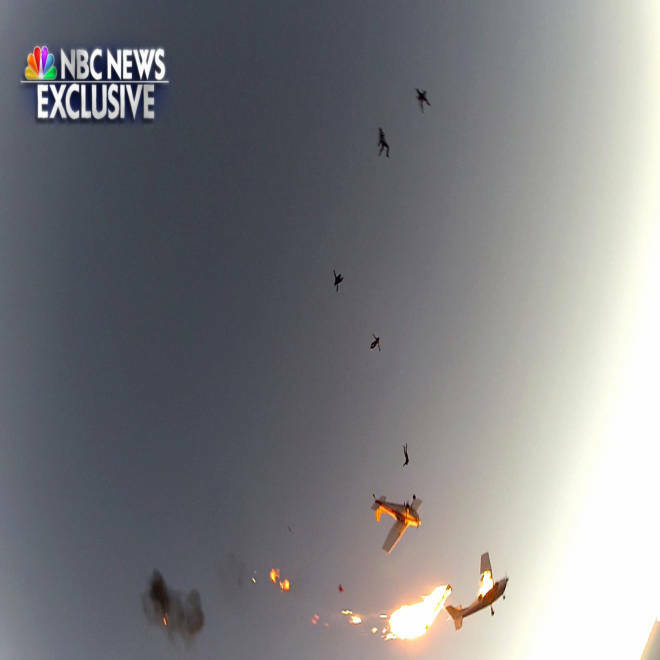 Instead, the footage filmed by five daredevils shows the terrifying moment when the aircraft collided above Wisconsin, flinging parachuters into the air like plastic action figures and sending one plane into a fiery dive across a sunset-lit sky. The images are heart-stopping: One Cessna suddenly sandwiched atop another; the legs of a jumper dangling over the tail of a plane; a skydiver hanging onto a step like an acrobat before he lets go; a fireball roaring out of one plane as it plunges downward. The thrill-seekers' helmets also filmed the miraculous aftermath of the crash: one by one, the jumpers landing on the ground, shaken but largely uninjured, and hopping into a truck to gather up the others. All nine skydivers survived. The only person injured was the pilot of the Cessna that lost its wing. He had on an emergency parachute and escaped through an emergency chute and suffered cuts. The pilot of the other plane was able to pull out of a dive and land at Richard I. Bong Airport in Douglas County. “The outcome for us was as good as it could be,” Mike Robinson, one of the passengers, told NBC News over the weekend. Robinson, 64, said then that the two single-engine planes were in position for a maneuver called a tracking dive, with one closely following the other. There were several passengers in position to jump from an exterior step on each plane when the collision happened. Others were inside but quickly leaped out. 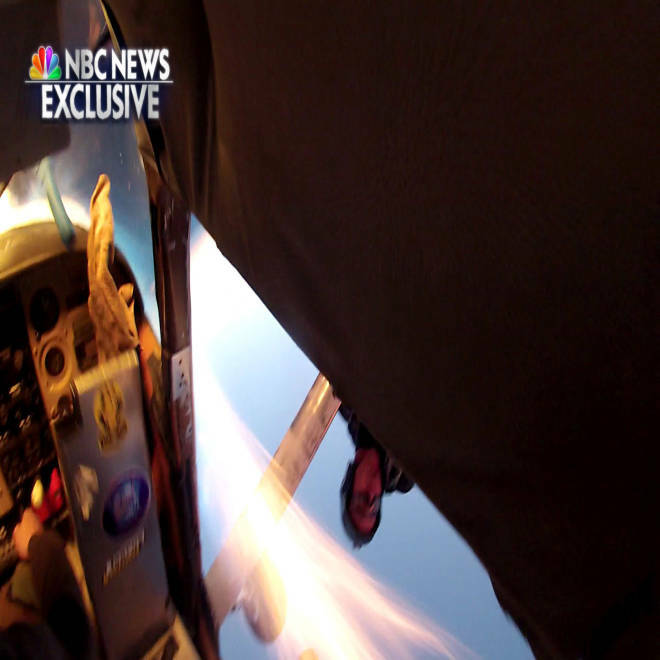 The video shot by Amy Olson, apparently taken while she was still inside the plane, shows three fellow divers out on the step when the plane below them is suddenly right underneath. They leap as a fireball flashes. Down below, John Rodrigo looks up to capture the planes pancaked on each other and then the tiny figures of his fellow passengers floating down. Footage from Chad Ebling's helmet shows two people on the step when the planes hit each other, and then his own legs draped over the tail. 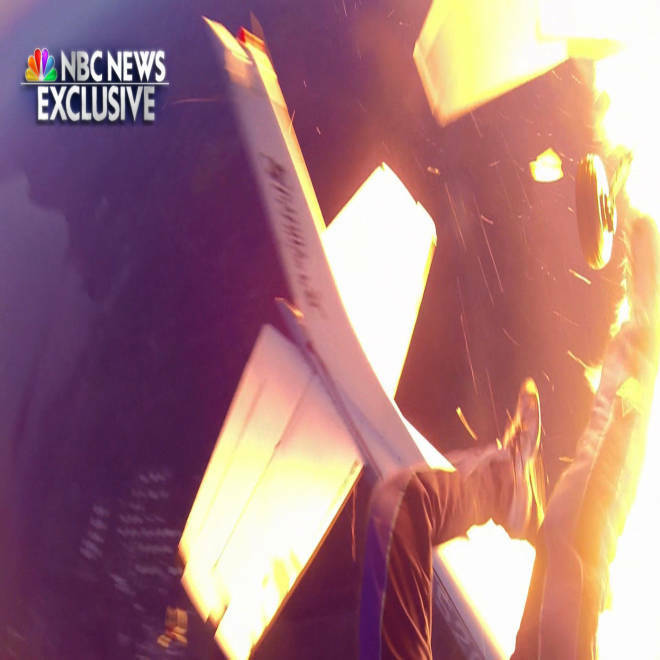 Robinson's camera filmed the crippled plane he left behind as it plunged to the ground — missing a wing. The cause of the accident is unknown, according to the Federal Aviation Administration. The planes were owned by Skydive Superior. Robinson told NBC News after the crash that he was the oldest member of the group. “This was my fourth jump of the day – I have over 900 skydives,” Robinson said. NBC News' Elisha Fieldstadt contributed to this report.